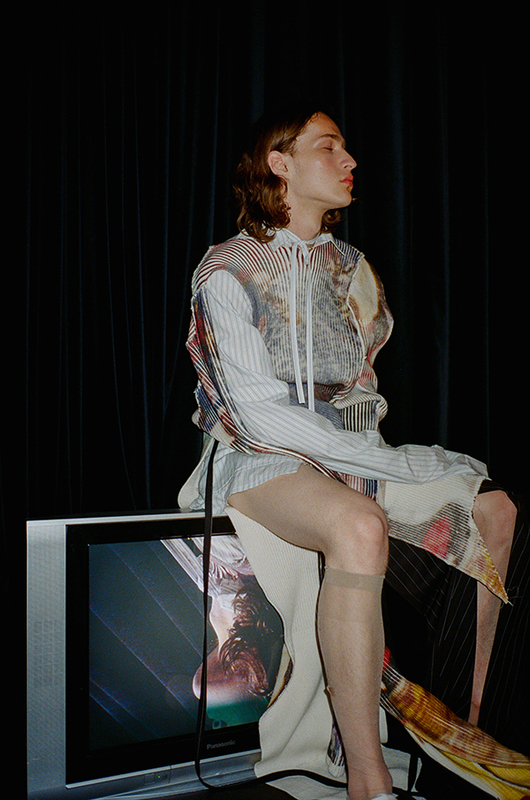 Sydney-based designer and art director Samantha Diorio has a desire to make people feel, to alter their way of seeing and consuming and to challenge the foundations upon which fashion lies. 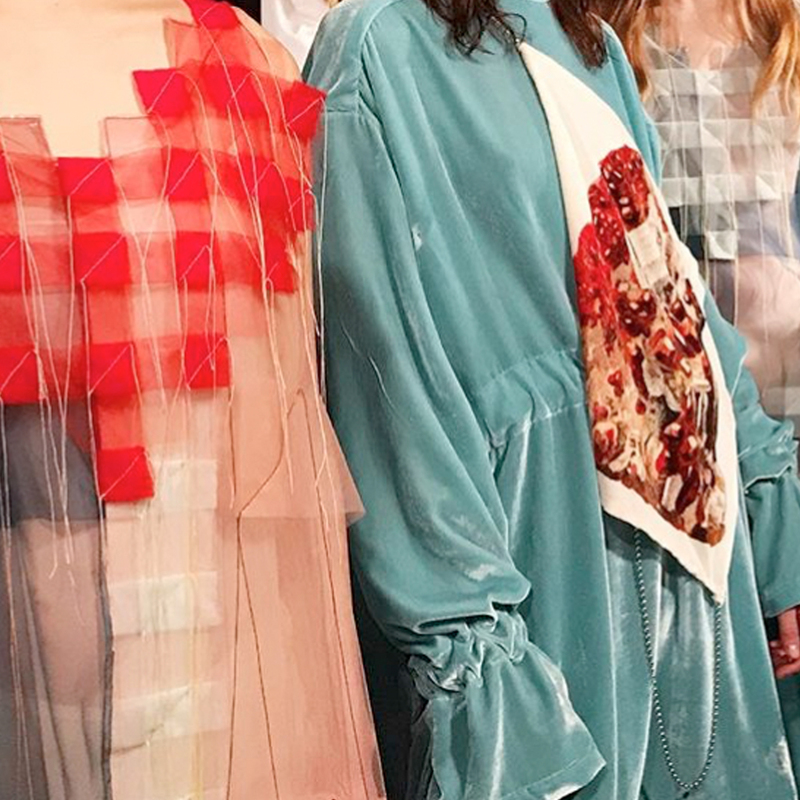 Between finishing her Honours in Fashion and Textiles at UTS, creating, making, showing and sharing; Ms Diorio is also the hip prodigy behind a super shiny Insta account @hautebasics – described as “aggregation and curation of both past and contemporary imagery”. For serious eye candy, this is a must follow! The divine images here are from her graduate collection 2017 ON AGGREGATORS which was proudly sponsored by us. This powerful and accomplished collection is an autobiographical anecdote about the aggregator and aggregation as a design practise. Describe your aesthetic in three words. If you could live in any era, what would you choose, fashion-wise? Definitely the era that I grew up in – the 90’s. I find photography and fashion imagery so incredibly comforting during this period. 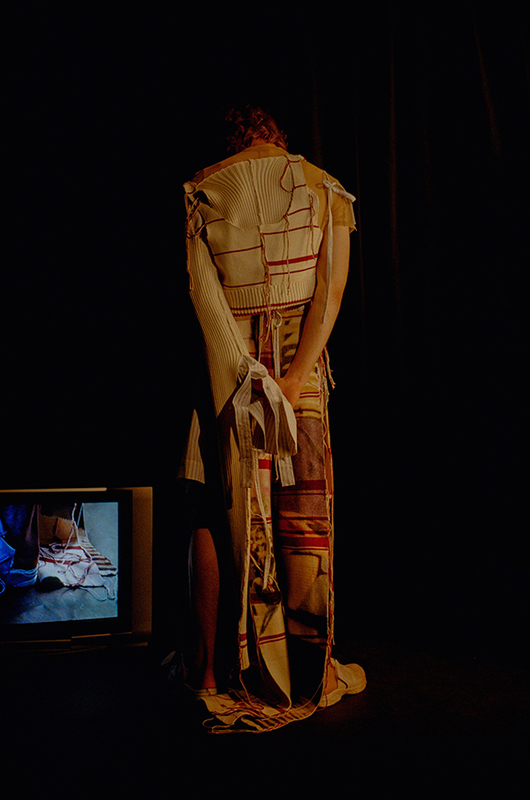 ’Merce Cunningham: Scenario’ performance along with the late 90’s-000’s Margiela by Mark Borthwick and all Helmut Lang imagery by Juergen Teller are like my home within fashion. There’s something I find in these archival images that reflect a certain part of my identity. That archival rawness and simplicity is so incredibly textural and emotional. As an artist, who are some of your most important creative influences? J.W. 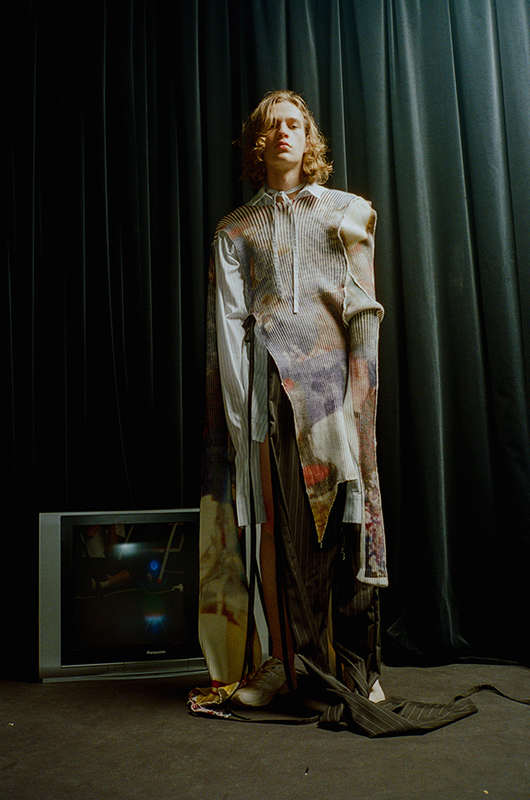 Anderson and Maison Margiela are at the top of my list. Simultaneously, photographers including Mark Borthwick’s 90’s photography alongside Harley Weir, Juergen Teller, Jamie Hawkesworth, Coco Captain, Masha Mel, Alice Rosati and Alice Schillaci all influence my practice. Knitwear. There’s such a raw-ness that can be captured. The texture and feeling is so nostalgic to me and it’s the only textile that I find to be so versatile in both innovation and practicality. I love the potentials it holds in the ways that it can evoke so many things just by being purely visual and tactile. A camera. I love capturing moments and turning them into something exciting and new through post-production. We love sharing design students journeys! How has our sponsorship helped you throughout your Honours? It helped me realise the potentials of knitwear and my love for distorting images and objects with it. Think Positive has supported the creative visions of my practice, despite the limitations. It was amazing to have worked with a company that pursued my creative vision. The scholarship helped me grow personally where I was able to re-connect with my family history through photos and images whilst at the same time exploring new and innovative textile forms through a creative and expressive practice. 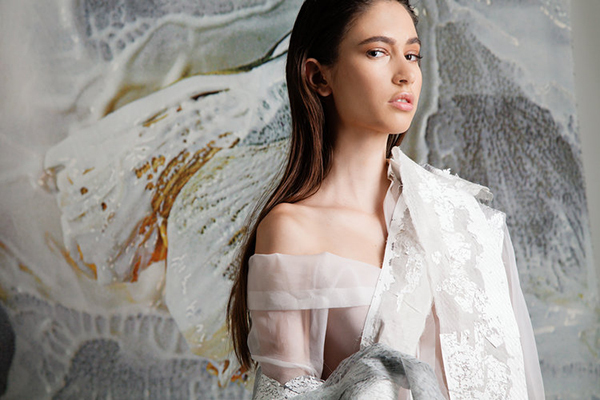 It made me fall in love with creating innovative textiles and pushed me to realise that knitwear and creating imagery either singularly or through the textile itself is really what I am about within my practice. I couldn’t be more grateful. What can we expect to see next from you and your designs? Also, what are your post-graduation plans? I got to a very close point in my Honours collection where I was so conceptually driven and it lead me to realise what I really want to do with my practice and the people I aim to collaborate with. 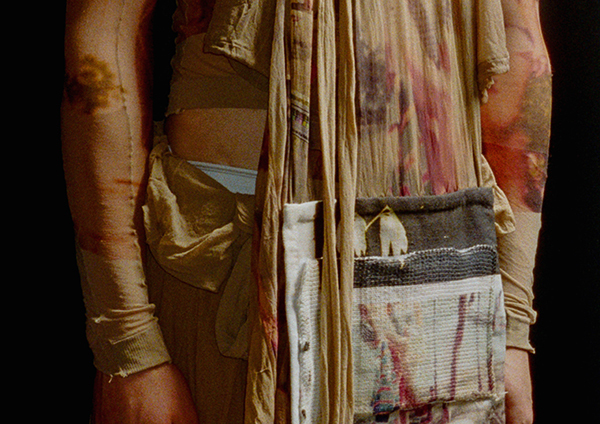 Physically however, I want to explore so much more – textile and image wise. I really want to find a happy medium between creativity and commercialisation without jeopardising the identity of my practice and what I am trying to voice. I will still keep pushing knitwear innovation with the generation of imagery and objects however. As to what’s next, my books are entirely open. Masters, internships and collaborating with people that inspire me daily are all on the list.